I come at painting from the wrong way around. I do not set out to illustrate anything – not an object, a scene, nor an idea. The painting is a record of events in the studio and of experiments both intuitive and calculated – with color, with the physical properties of paint on a surface, and with random shapes and gestures. Throughout most of the process, the subject of the painting is the painting itself. Marks, colors, and shapes accumulate, are modified, are erased by abrasion or layering, are consolidated and connected to one another. Over time a working surface is built, destroyed, and rebuilt. During the process, as work continues, glimpses of subject matter beyond the canvas begin to appear. 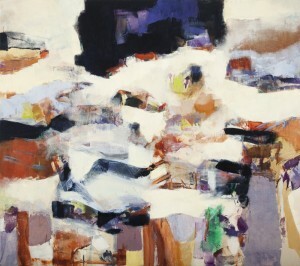 Relationships and connections develop between what happens on the canvas and personal memories of dreams, events, and landscapes. 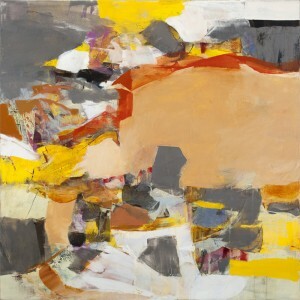 The painting moves from an inchoate assemblage of visual elements to “something resembling something,” however abstract. Relationships are built, strengthened, diminished, redrawn. Within this seemingly random process, there are themes and patterns that recur. The image is oriented to the edges of the canvas. The surface constitutes a shallow field of space established by variations in transparency and intensity. The color black is important to the overall visual structure. There is a balance between finished and raw, dull and bright, areas of gestural activity and areas of calm, between grace and awkwardness. Over time I have realized that the paintings echo similarities in structure that can be perceived over vast differences in scale: from microscopic views of insect wings, to geological processes in land formations, and even to hypotheses about the ordering of matter in the cosmos. These structures then are ultimately the subject matter, arrived at more viscerally than intellectually, through the process of painting itself. Come see artwork by artists JoEllyn Loehr, Katie Anderson, Leif Anderson, Patti Bowman, Betty Jo Costanzo, David Owen Hastings, Rafael Soldi, Bradley Taylor, and June Sekiguchi in our Summer Introductions exhibition opening Thursday, July 19, 2012.